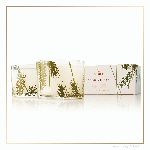 Thymes Frasier Fir Pine Needle Candle Set is the classic seasonal fragrance that's perfect for holiday celebrations. Some might call this a Christmas candle set but it’s so much more! Thymes Frasier Fir candle set fills your home with crisp, just-cut forest fragrance that evokes seasonal celebrations, holidays and the winter solstice. A glowing focal point for entertaining, holiday décor, hostess gifts and more.